If you are thinking about planting a gothic garden, fairy garden, or moonlight garden, but don’t know where to start, reading the informative book, Garden Witchery: Magick from the Ground Up, is a great way to begin. 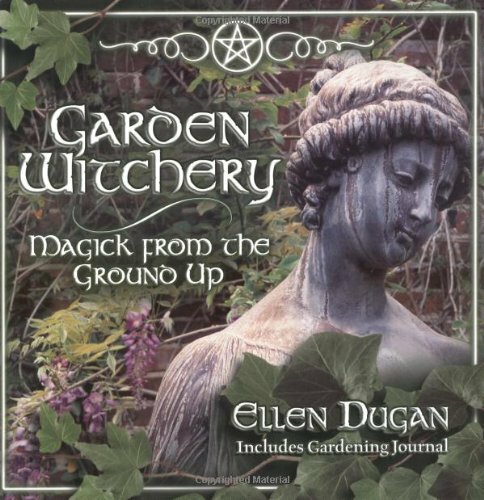 This book is authored by Ellen Dugan, the “Garden Witch”, who is also a psychic-clairvoyant as well as an award winning author. The book will give readers an introduction to the world of gardening that outlines the basic principles of gardening, along with a unique blend of traditions rooted in Wicca and magick. The book, which received a 2004 Covr Award, covers many different topics, including garden blessings, flower folklore, faerie magick, creating sacred space, and moon and astrological timing. Other topics include information on beginning to areas of more advanced witchcraft, Sabbat celebrations, floral and herbal spells, and shade, sun, and moonlight gardens. Readers will also learn about how certain herbs correspond to magick. You will even discover how to make crafts such as sachets, charm bags, and wreaths, made from the items you will grow in your garden. The book also includes a section for journaling which allows readers to record their own progress and of things learned from the book. The author stresses the importance of working hard when making your garden and emphasizes that it should be a place where the ordinary and metaphysical aspects of each of our lives should come together in a positive way. Several customers who have purchased this book agree that they enjoyed the informative descriptions, as well as the sense of humor of the author and describe her style of writing as making you feel like you are talking with a close friend. This book will provide readers with all of the instructions necessary for creating an enchanted or gothic garden using trees, shrubbery, and flowers. Information on the soil requirements for specific plants and hardiness zones is provided. You will be provided with a unique learning experience through reading this book, as it explains the meaning of certain plants in the world of magick, such as what their shapes, colors, and fragrances represent in magick. Recipes for aromatherapy and alternative health are also included in the book. Whether you have plenty of gardening space available for planting, or are restricted to a very limited area such as a patio or balcony, the author will offer helpful tips and suggestions to help you make a garden that works for you and your situation. This book will help readers get in touch with nature and their spiritual side through gardening and working with the earth. In her book, Dugan discusses how planting such flowers as yarrow, rosemary, and violets will attract faeries to your garden space. Many readers say that even if you are not a practicing Wiccan, this book offers many valuable tips about gardening that should not be missed. Dugan offers advice on what types of flowers, shrubs, and trees to plant, based upon the type of garden theme you are wanting to create. You will find out how planting an apple tree is associated with health and love, and learn such interesting things such as what it means when someone places stones in a circle in a discreet corner of the garden. Whether you are looking for the perfect place to perform magick, cast spells, or divination, this book will show you how. Even if you are not into the spiritual aspect of the book, it still makes for a great, entertaining read and is full of useful information for anyone, regardless of religion, who is seeking to create a special garden space. No matter whether you are a witch or not, this book will provide the inspiration you need to get down and get dirty in the ground planting beautiful plants that will bring you joy. Whether you plan on growing a fairy garden, gothic garden, moonlight garden, etc., this book can serve as your own personal manual to provide you will all of the information you will need. Imagine the satisfaction you will receive from watching your ideas literally blossom in front of your eyes. A fast and engaging read for everyone from newbie to experienced gardeners, Garden Witchery by Ellen Dugan is a must read.